Who listens to the baby whisperer? 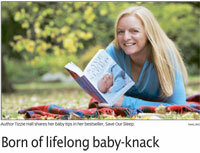 An article in the Leader newspaper Australia about Tizzie Hall and her new “Best Seller” Save Our Sleep. Interview on ABC Radio, Western Australia. Tizzie Hall spoke to Liam Bartlett about her baby sleep routines.